NEW YORK – May 16, 2011 – Red Thread Theater premieres “Facing the Minotaur” June 3 – 4, 2011 at The Spoon Theater, 38 West 38th Street, New York City. This newly devised work was created by an ensemble process designed to uncover autobiographical material with transformative potential. James Baldwin once wrote that “Not everything that is faced can be changed, but nothing can be changed until it is faced.” In “Facing the Minotaur”, an ensemble of six directed by Julie Rosier, interweaves three real life journeys of courageous self-confrontation by ensemble members DR Mann Hanson, Quai Nystrom and Kimberly Shelby-Szyszko. The play is framed by the Greek myth of Theseus, a young Athenian who braves the labyrinth to slay the man-eating minotaur at its center, relying only on a magical red thread to guide him back to freedom once the heroic deed is done. The multi-plot narrative unfurls as three storytellers descend into the twisting maze of lived experience to face the shadowy creatures dwelling at the core of consciousness. One protagonist searches for the antidote to her “toxic” voice while battling her aging ovaries. Another pushes boundaries by revisiting an interrupted childhood. The third struggles to reconcile his desire for authentic sexual expression with fervent religious strivings. After they have faced their minotaurs will the red thread, a timeless and unbreakable bond of common human experience, reveal itself in time to lead these modern-day heroes to a triumphant return? Cast includes Kate Dickinson, DR Hanson, Evelyn Holley, Christina Neubrand, Quai Nystrom and Kimberly Shelby-Szyszko. 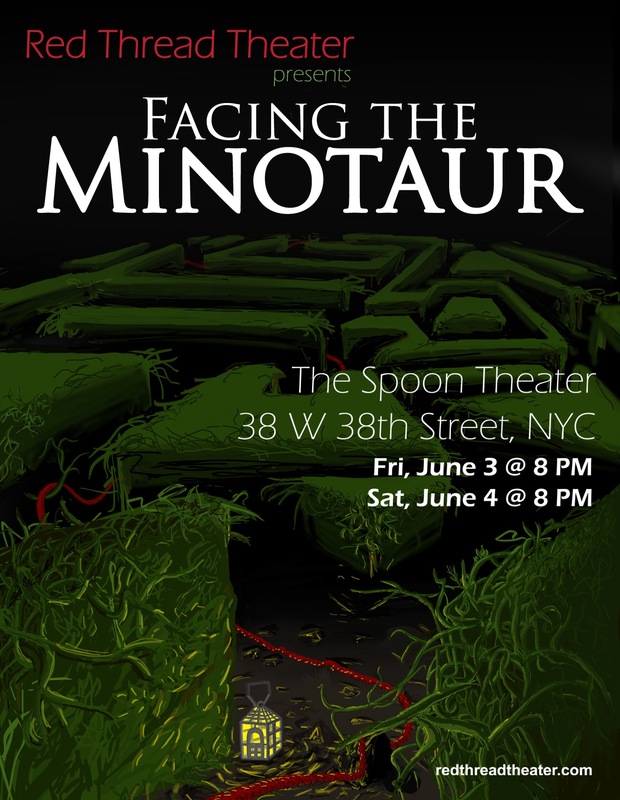 “Facing the Minotaur” will run from June 3 – 4, 2011, 8pm, at The Spoon Theater, 38 West 38th St. 5th Floor (between 5th & 6th Avenues), New York, NY.